1. Andrea L W. et al: The biology of Stat4 and Stat6. Oncogene, 2000,19: 21, 2577-2584. 2. Cosio. G M.: Autoimmunity, T-cells and STAT-4 in the pathogenesis of chronic obstructive pulmonary disease. Eur Respir J, 2004; 24:3-5. 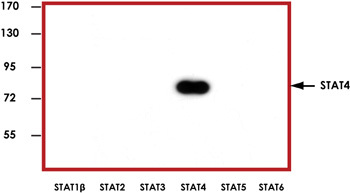 Sample Data : Representative western blot with Anti-STAT4 (1:1000) using 20 ng of human recombinant STAT1β, STAT2, STAT3, STAT4, STAT5, and STAT6. Scientific Background : STAT4 (signal transducer and activator of transcription 4) is a member of the STAT family that is phosphorylated by receptor-associated protein kinases. STATs form homo- or heterodimers and translocate to the cell nucleus where they act as transcription activators. T helper (Th) cells differentiation is regulated by STAT4 (1). STAT4 controls T1/T2 balance during the response to live influenza virus and isolated viral proteins. The differentiation of gamma interferon (IFN-γ)-producing Th1 and Tc1 cells after inoculation of live virus occurred independently of STAT4 expression. STAT4 has been shown to control pathogenesis of chronic obstructive pulmonary disease (2). Stability : Store at 4°C (add 0.1% NaN3) for several months, and at -20°C for longer periods. For optimal storage, aliquot target into smaller quantities after centrifugation and store at recommended temperature. For most favorable performance, avoid repeated handling and multiple freeze/thaw cycles. STAT4 from other species may also be detectable.